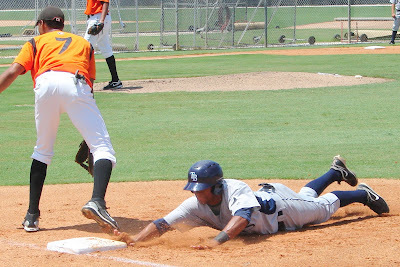 Click on the photo below to view the gallery from Friday's game between the GCL Rays and the GCL Orioles from Ed Smith Sports Complex in Sarasota. The Rays shut-out the Orioles 3-0 in the contest. Matt Fields, who is with the Rays while on the DL from Charlotte, has shown he has power as a switch hitter, striking his second homer of his assignment with both of them being from the left side of the dish. Enjoy the photos.